← How to encrypt PDF by command line under Mac system? For protecting PDF document from being copies, printed without author permission, usually we will set password to protect PDF files. However, for some reason, like forget password we need to remove password from PDF in batch. In this article, I will show you how to remove password under Mac system by the easiest way. The software I use is named as VeryPDF PDF Password Remover for Mac, which also has Window version available. Please check more detail information on homepage, in the following part, let us check how to use this software. This software has user friendly software interface, which is extremely easy to use. When downloading finishes, there will be a .pkg file. Please install this software by double clicking the pkg file and follow installation message. When installation finishes, please click Finder then go Application to find software application. Under Mac system, there is no short cut icon on the desktop. The following snapshot is from the software interface, please have a check. Step 2. 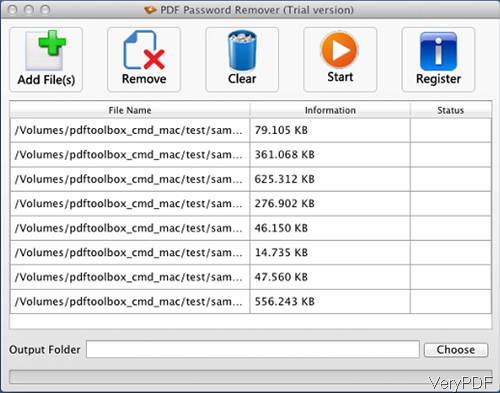 Remove PDF password under Mac system. This software supports all version PDF files, so there is no PDF version limitation of this software. And this software supports 40 and 128-bit RC4 encryption and 128 and 256-bit AES encryption. And by this software, you can remove owner password directly. And when you need to remove open password, you need to have the right to remove it. By this software, you can remove limitations of printing, copying, modifying permissions and others. When you open software interface, please add PDF files with password to software interface then they will be shown on software interface with file path and size. Remove option can help you remove PDF file one by one, Clear option can help you remove all the added PDF file in the list. Then click option Choose to specify output folder to save PDF file without password. Click button Start, the removing process will be launched at once. When removing password successfully, status will tell you success or fail. Just two steps, we can remove PDF password. Is that easy enough? When removing password, sometimes there will be dialogue box reminding you to input password of user and owner. This kind of situation happens when remove PDF with open password. Or there is some kind of PDF, when open it, you need to download plug-in. When handling this kind of PDF, there will be some problem. No matter how, this circumstance seldom happen, during the using, if you have any question, please contact us as soon as possible. This entry was posted in Software for Mac and tagged remove PDF password. Bookmark the permalink.